Nine years ago, former Washington Capitals defenseman Mike Green did something unprecedented for a blueliner. From January 27, 2009 through Valentines Day, Green scored a goal in eight consecutive games, setting the NHL record for most consecutive games scoring by a defenseman. 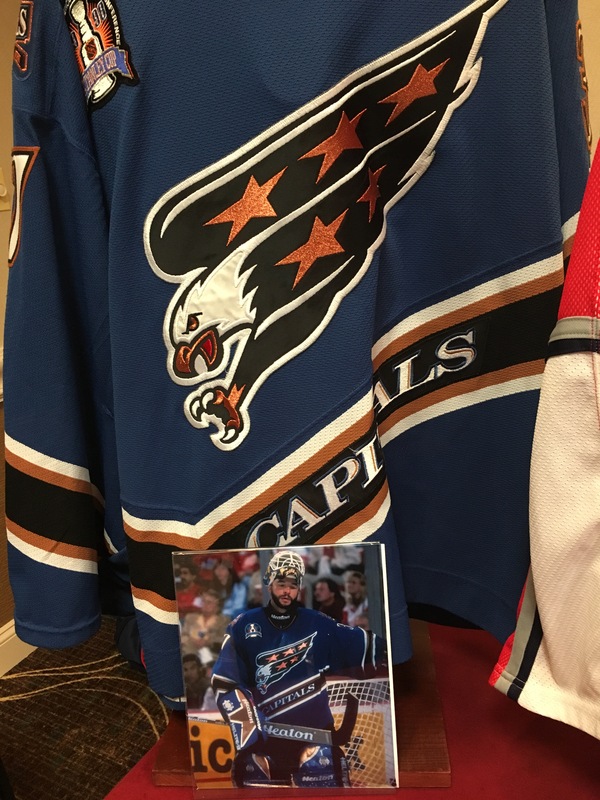 One hockey collector had a display at the 2018 NOVA Game Worn Jersey Expo that showed off some game used jerseys, pucks, and more from that historic milestone. Chuck Fritter has been collecting hockey jerseys and memorabilia for the last 25 years. He started out collecting autographed mini helmets before a dealer approached him and offered to sell him a stick. “One stick became 10 sticks. 10 sticks became 20 sticks and then I was like ‘I’m gonna get a jersey, just one jersey’. One jersey then turned into over 100 jerseys over the years. Some jerseys are great, some are one game wonders while others become historical pieces,” said Fritter. The eight consecutive game stretch began in late January in Boston and concluded on Feb. 14 in Tampa Bay. Green had 10 goals during that eight game stretch and had two goals in their games on Feb. 7 vs. the Panthers and Feb. 11 at the Rangers. The record breaking goal came in the second period of the Capitals game at the Lightning on Feb. 14 on the power play at 5:33. The Capitals won that game 5-1 and Green’s dad was in attendance as the occasion was also part of the infancy of the annual fathers and mentors trip. Green spent 10 seasons with the Capitals with his final season in DC taking place in the 2014-15 season before joining the Detroit Red Wings via free agency. Each year, hockey jersey collectors throughout the DMV come show off their stuff at the game worn jersey expo but must have a different theme every year. The idea behind the Mike Green theme that Fritter used was inspired by the rumors that the Capitals were going to land Green at the trade deadline. While the Mike Green reunion didn’t happen the display was still a good trip down memory lane. Included in the display were three jerseys, the one Green wore when he scored the record breaking goal in Tampa Bay, Karri Ramo’s jersey- the goalie that Green scored the historic goal on, and a home red jersey that Green wore in the middle of the streak. There was also a lineup card from the Capitals game against the Rangers at Madison Square Garden on Feb. 11, the game that Mike Green tied the consecutive games scoring record. In a case, there were five game pucks from five of Green’s 10 goals scored during that stretch. Only a few games were missing including the puck that was scored for the record that Green kept himself. You can get a tour of the display in the video below. Aside from the Green display, Fritter also had an Ollie Kolzig jersey that was worn during the Capitals 1998 playoff run that saw them reach their first Stanley Cup final. “It was worn throughout the playoffs through Game 6 of the Eastern Conference Finals,” Fritter explained. In addition, Fritter also had two All Star Game jerseys. The first one was worn Kolzig in 2000 All Star Game in Toronto while the second one was sported by Peter Bondra in the 1999 All Star Game in Vancouver. This entry was posted in Collecting, Fan Profile, Fans, Memorabilia, News, Washington Capitals and tagged Capitals Collectors Corner, Capitals fans, Collectors Corner, Defense, Defenseman, Fans, Jersey Collection, Memorabilia, Michael Marzzacco, Mike Green, Milestone, NHL Record, Record, Washington Capitals. Bookmark the permalink.